US Treasury Secretary Tim Geithner listens during an economic daily meeting March 23, 2009. To stop the economy's deflationary spiral, President Obama and Treasury Secretary Tim Geithner need to get toxic assets off banks' balance sheets so the banks can start lending again. With much fanfare and after much delay, Geithner on Monday unveiled the details of the government's "public-private" collaborative plan to make that happen. 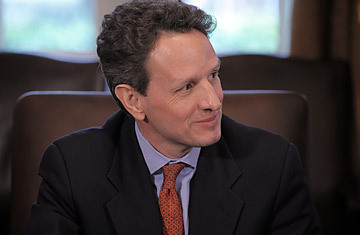 Judging from the reaction of industry analysts and the market, Geithner succeeded Monday. The Dow Jones Industrials, led by financial stocks, rallied nearly 500 points, or more than 6%. Scott Talbott, the top lobbyist for the Financial Services Roundtable, said that while some information is missing there's probably enough for buyers to figure out whether it's worth risking their money. "It's not perfect," Talbott said, "But it is a workable framework." Constructing a strong framework around the shakier parts of the program was the key. To that end, Geithner spent the first part of the press conference talking about all the other programs he and the rest of the federal government have so far unveiled: help with housing, consumer loans and stabilizing banks balance sheets with direct infusions of cash. When he finally rolled out the toxic asset plan itself  in three separate parts  he carefully packaged the shakiest component with ones the market was more likely to have confidence in. First, he highlighted a massive new FDIC program to get the banks to sell troubled mortgages. For all the focus on complex securities based on bad loans, the bad loans themselves pose the greatest threat to banks' balance sheets, according to the Treasury department. Bill Gross, chief investment officer of the massive PIMCO bond firm who has been in conference with the government about participating in the plan, estimates the loans pose up to a $1 trillion problem for the banks, and the new program taps FDIC funds to get investors to buy those loans from the banks. Gross told CNBC today that he would participate in the plan. Lastly, Geithner got to the "Public Private Investment Fund" for the securitized assets now clogging the banks' books. The plan envisions creating five investment funds under five outside asset managers. Those managers will get dollar-for-dollar matching investments from the government to buy what were once triple-A rated toxic assets from the banks, and can apply for loans from the government to further leverage their purchases. The strength of the three-part rollout is the advantages of one rubbing off on the others. In an example provided by the Treasury for the FDIC part of the plan, an investor could put up $6, get matching investments from the Treasury for another $6, then obtain loan financing of $72 from the FDIC. This would allow the investor to purchase a security with an $84 auction price (and a face value of $100). Again, Geithner did not provide details on the terms of those loans. Those are more attractive terms than the TALF or investment funds offer, and the buzz that it immediately generated helped give the whole package a good investor-friendly feel. But the TALF plan helps in its own way. Though just getting started, it seems to have a chance at success, and thus gives the impression that the collaboration between the government and investors might work. Next to those two pillars, the once shaky "public-private investment fund" idea now seems sturdier and more likely to succeed. Read "The AIG Backlash: Has Congress Flipped Out?"